There is a lot of psychology behind how we spend money. What we value, how we perceive ourselves (and how we perceive others see us) can contribute to our financial success. We also make up all kinds of excuses for why we can’t save money. We rationalize our reliance on debt. When the cost of goods goes up and income stays stagnant, it’s easy to start believing you can’t get ahead. It’s easy to think you can’t save any money. The truth is that you can save money, but sometimes you have to be sneaky about it. Sometimes you have to trick yourself into it. This is one of the most common tips a personal finance person will give you. Have a portion of your paycheck automatically put into a savings account. Ideally, this should be 10 percent of your income, but even if you only put $10 away, it’s a start. Put it into a savings account and don’t touch it. If you have to, put it in a bank in another town so it’s harder to get at the money. If you don’t see that money in your checking, you won’t be tempted to spend it, and that money will be available to you for emergencies or to help pay for big ticket items. Put an extra $50 or $100 in your interest bearing checking account, but don’t enter it in your checkbook register. Once again, out of sight, out of mind. Don’t spend pay raises and bonuses. Whenever you get a pay raise, a bonus, or windfall, put it straight into savings. Pretend it never happened. You already know how to budget on the old income, so tuck away the new money before you start spending it on new stuff. You won’t suffer from lifestyle creep, and you’ll make saving money easier on yourself. If you want to break that credit card habit, put them in some water and freeze them. There’s nothing like having to chisel out a card from a block of ice to make you think about how much you need to make a purchase. If you don’t want to freeze your cards, just pull them out of your wallet and put them in a secure location in your home. The internet and the library offer a vast amount of resources to help you become a better cook. You can also take a community education class to learn a few culinary tricks. When you eat well at home, you’re less likely to seek out overpriced (and sub-par) restaurant meals. You’ll soon find yourself believing that you can make almost any meal better than most restaurants. And you’ll save a ton of money that way! Learn to find high quality clothing and home decor items at significant discounts. You’ll feel like a million bucks, but your bank account will never know it! Use your library, attend free community events, and sign up for free samples by mail. You’ll stretch your budget and avoid feeling deprived when you’re on a tight budget. As a cheapskate, I absolutely love figuring out ways to make things last longer. How much can I water down the juice concentrate before the kids complain? How much of the toothpaste can I squeeze out of the tube before I give up and replace it? How can I re-purpose something to give it new life? Make it fun, make it last, and save money. One of the best ways to encourage savings without making it feel like drudgery is to make a game out of it. For example, you could challenge yourself to keep your grocery spending under $40 a week. Or you could challenge yourself to only spend $200 on Christmas. You could challenge a friend to see who can find the best deal on an item you both need or see how long you can go without spending money. Have fun pushing yourself to reach a savings goal. What are you saving for? Set a good, reachable goal. Post a picture of it in a prominent location in your home or put a note in your wallet. Remind yourself why your pinching pennies and it will be easier to stay on track. You can even send yourself regular reminders via e-mail or on your phone’s calendar. You know how you tell your toddler they can have a treat if they’re good in the store? Well, it works on grown-ups, too. Set a savings goal, and when you’ve reached it, give yourself a small, simple reward like a book, a music download, or a dinner out. Those little incentives can help keep you on track toward your goals and help make saving money more enjoyable. We know that there are things that cause us to spend money. But if we can figure out what tricks get us to save money, we’ll be on the right track to better finances. 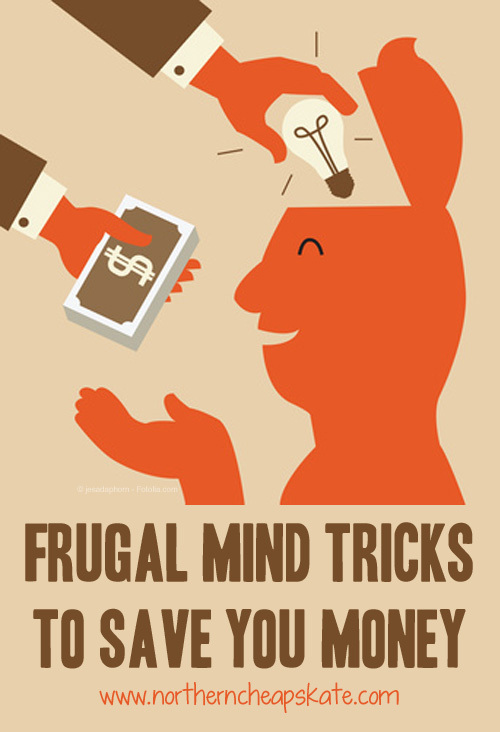 What are some frugal mind mind tricks you use to get yourself to save? Tricking yourself is a very good way to save money. It goes right in hand with the old ‘out of sight, out of mind’ philosophy, and works well because if you don’t see the money, you’re not tempted to spend it! Haha, I love the idea of goal-setting as bribery. I mean, it absolutely is. It’s just a perspective I hadn’t thought of. It’s amazing what an extra $50 or so can do, isn’t it? We can’t afford to dump a bunch of money in the emergency fund, but I want to push it higher. So I put $50 a month in. It’s slow progress, but I was shocked the other day when I noticed the account was up $400. Each time I get a raise, I sit down and divide it up among our mortgage payment and retirement account to make sure the extra money goes somewhere useful.